Ten years. 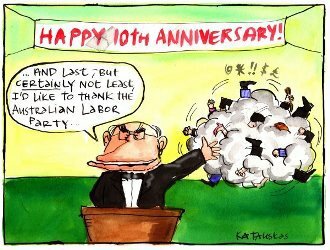 Ten long years of the Howard Government. Un-flippin-believable. As for the man himself, Howard says it's just another day in office. I think that may be the saddest thing of all. 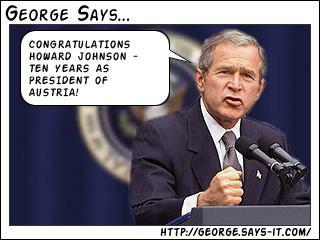 I remember watching the election night coverage on March 2 1996. I didn't vote that day; I was still only 16 (and that annoyed me. I understood and cared about the whole process, which is more than a lot of voting-age people do. The voting age should be lowered to 16, and compulsory voting should be scrapped) but I was concerned and upset. I didn't like the Liberals, I didn't like what they stood for and all I knew was Labor government, which seemed pretty good - why change it? That night I wrote about in my diary how much I regretted the whole thing. But I think the turning point came for me a few months later, in a conversation with my mother. She was discussing how annoyed she was that the local Medicare office had closed, and of the creation of Centrelink; I reflected on cuts to the ABC, the massive job losses in the Canberra public service, and the grief that all of this was causing ordinary Australians and I said to my mother "You know, it seems like since the Liberals were elected, things are worse than they've ever been." Some people did see what was coming - it was at this time that Powderfinger released their great, politically-influenced album Internationalist, the best-known track of which is about the rise of the Howard government and the right-wing in Australia. It certainly does feel like forever - all of my adult life. But the people I feel sorry for are those born after about 1984 - who cannot remember anything other than a Liberal government (alright, they most likely remember a time when Paul Keating was prime minister, but when you're 11, politics doesn't have make a significant blip on your radar, unless your a complete geek like me. I remember being twelve years old, listening to news radio one summer evening, then running to tell my father and his friends, "Paul Keating has defeated Bob Hawke! He's Prime Minister now!"). Anyway, they must think that Australia was always this way, this...I hate to say it...heartless and materialistic. That's not just my opinion - Australia is a meaner nation after ten years of the Howard government. And it is depressing. Although they disagree with the government on issues such as the environment, Australians keep voting for them - because they do a good job managing the economy! Australia is a meaner place - people's main concern is not doing good things, the right thing - but their own bank balances. I cannot imagine what would cause a change in this attitude. It's hard to imagine a change of government soon, certainly not given the sorry state of Labor in recent years, which has played a major role in ensuring the Howard prevalence. You can see reflections of the US - the parallels between the Democrats/Labor and the Republicans/Liberals are uncanny. Anyway. There's been so much written about this anniversary. Opinion runs the gamut from the ever-excorable Piers Akerman to the correct-although-self righteous Phillip Adams. But I'm eager to read what you all have to say.